... and I'd love for you to be real with me. I say this because many people feel like they shouldn’t be real with a rabbi. But I’m not that sort of person -- or rabbi, either. My “congregation” is you -- people of all backgrounds -- Jewish, Jew-ish, part of a Jewish family, considering a Jewish wedding or other ritual, or just wanting to explore. 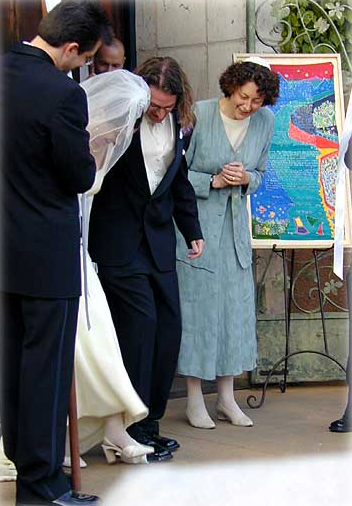 My mission, as a wedding officiant and a rabbi in general, is to learn about you -- your experiences, beliefs, longings, challenges, and what you might want or need from a rabbi at this time. Then I help you explore how Jewish tradition can enrich your wedding ceremony with depth and inspiration in ways that reflect your uniqueness as individuals and as a couple. If you feel drawn to the possibility of having a Jewish wedding, but aren't sure whether it could truly be meaningful for you, I especially want to invite you to be in touch with me. Jewish tradition can be much more open -- and connected to real life -- than it often appears. I will be glad to help you discover how you can come as you are and find wisdom and inspiration, depth and purpose, and draw on the tradition in ways that are intellectually honest, and relevant to your everyday life. I grew up culturally Jewish. My mother was bored by synagogue, and saw no reason to inflict it on us. My father grew up Catholic and then rejected his religion. We celebrated Jewish holidays at home, and with family and friends, and that was about it. As an adult, I grew curious, and decided to learn about Jewish tradition for myself. I found that it was more relevant and open than I’d expected, and that, at the core of Judaism is not dogma, but a search for what really matters. I eventually decided to become a rabbi, and was ordained within the Reform or Progressive Movement after six years of study in the movement's rabbinic school. I was a congregational rabbi for several years, yet also was aware of the many Jews and their family members who were not finding the meaning they sought in synagogues. One way I found to serve people beyond my role in synagogues was by officiating at weddings, and I continue to love doing so. I also saw that many individuals and families wanted an open environment in which they could explore how Jewish tradition might speak to them at all stages of life, so I started a non-profit organization called Jewish Gateways. I continue to lead this innovative and pluralistic organization dedicated to re-imagining Jewish life and making Judaism accessible and relevant to all. I would be delighted to learn about you, to give you a chance to get to know me, to answer your questions, and to share our ideas about and visions for your wedding ceremony. Click here to schedule a free, no-obligation, one-on-one consultation with me. I truly hope to hear from you. Bridget worked with us to develop a very personal ketubah (document on which wedding promises are written) which reflected our hopes for our marriage. At her suggestion, we keep the framed ketubah in a place where we can review it often to remember what we pledged to each other.